Rensselaer professor Eddie Ade Knowles will be featured in a documentary about renowned jazz and soul artist Gil Scott-Heron airing Wednesday night. “(Scott-Heron) had never done poetry with drums and so we spent some time in terms of how to do this with conga drums being played,” Knowles says in a preview of the documentary. The documentary “Unsung: Gil Scott-Heron” airs at 10 p.m. Wednesday, Feb. 12, on TV One, channel 184 on Time Warner Cable locally. I spoke to Knowles today (Wednesday) and he gave me some more details about how he and Scott-Heron came to work together. The met at Lincoln University in 1968 when Knowles was a transfer student and Scott-Heron was a freshman. Knowles was in Scott-Heron’s band until 1975. “When we started working together as students at Lincoln … we were just really continuing to develop a legacy that already existed there,” Knowles said. Lincoln is the oldest historically black university in the country and has a lengthy roster of notable graduates, including Supreme Court Justice Thurgood Marshall and acclaimed poet Langston Hughes. “What stands out most in working with Gil was his willingness to embrace the drum as a nexus for communication,” Knowles said. Throughout the late 60s and early 70s as they performed together, often with several other drummers, Scott-Heron’s signature style of poetry backed by drumming began to take shape. Knowles performed with Scott-Heron until 1975. Knowles said he hopes the documentary exposes younger people to Scott-Heron’s body of work. He recorded his interview in July and did not view the completed documentary before the air date. Scott-Heron’s legacy of educational, provocative, and challenging work transcends his complicated life, Knowles said. “The timeliness of the message gave it real significance, currency, within the movement,” Knowles says in the documentary. Click here to watch a preview of the documentary (fyi: there’s a 30-second commercial that plays before the video clip). Drums have been the beat behind Knowles’ entire career. At Rensselaer, he has taught African and Afro-Cuban music. The ongoing interest of students who had completed his courses led him to found Ensemble Congeros, an ensemble of Rensselaer alumni and students who study and perform Afro-Cuban, African, and New World percussion, in 2004. More recently, he has also founded The Roots of Africa Music Ensemble, a five-member group that will have its first public performance at 6:30 p.m. Thursday, Feb. 20, at the opening of the Black Student Alliance’s Annual Black History Month Art Exhibit in Shelnutt Gallery in the Rensselaer Union. Now a Professor of Practice in the arts department of the School of Humanities, Arts, and Social Sciences, Knowles held the post of Vice President of Student Life and Adjunct Faculty until 2011. 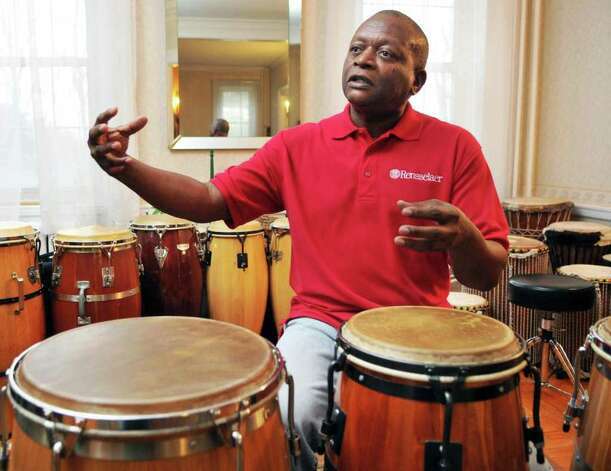 Read more about Knowles’ lifelong passion for drumming in this Times Union article. Want to hear more from Knowles? Listen to his WAMC interview with Joe Donahue and Alan Chartock in which he explains in much more detail the courses he now teaches and the work he does with Ensemble Congeros.